This is the second year that we will be sending all of the kids off to school, but the first time they are all leaving on the same day. In our school board, Junior Kindergarten has what is called ‘staggered entry’, meaning the youngest students come a few at a time over a period of a couple of days. By the end of the week, everybody is there together. The senior kindergarten class begins on the first day and simply does not stop. And that’s where we will be, on September 5, 2017 We will begin and we won’t stop. Is there any good way to get kids excited about their first day back to school or calm jittery nerves? Often the fear and anxiety comes from the unknown. We all know that once we have accomplished something, the next time around isn’t nearly as scary. Since we can’t have a trial run at the first day of school, we can read about it. 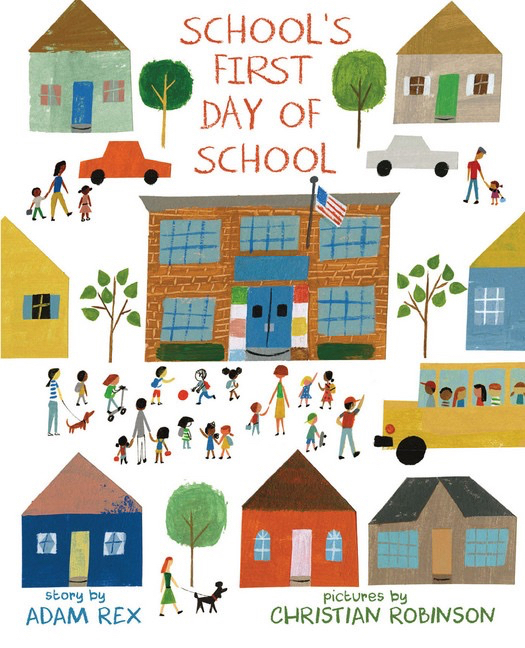 Here are three illustrated books to help calm everyone’s back to school nerves. Awhile back we reviewed Herve Tullet’s Za Za Zoom board game. I am happy to report that it still makes a regular appearance around here. 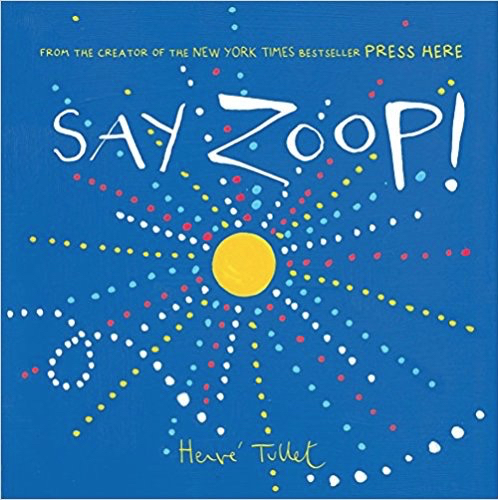 In his latest book, Say Zoop, Tullet has given his young readers full license to make noise. Lots of noise. Simple colours and words help young children explore the connections between sounds. This book would be a great bedtime calming exercise (it’s very repetitive). I can also see it being helpful for children with speech delays. Say Zoop is definitely a pre-school to kindergarten age book. People certainly get nervous the first day of school, but have you ever thought about how a new school feels about it? You might not have, but Adam Rex certainly did. School’s First Day of School shows us the first day of school through a brand new building’s ‘eyes’. School eventually learns that he is not alone in his fears about new people and experiences. This book would be appropriate for kindergarten to grade 2 as a read aloud book. Past that age, some kids might be interested enough to pick it up on their own. 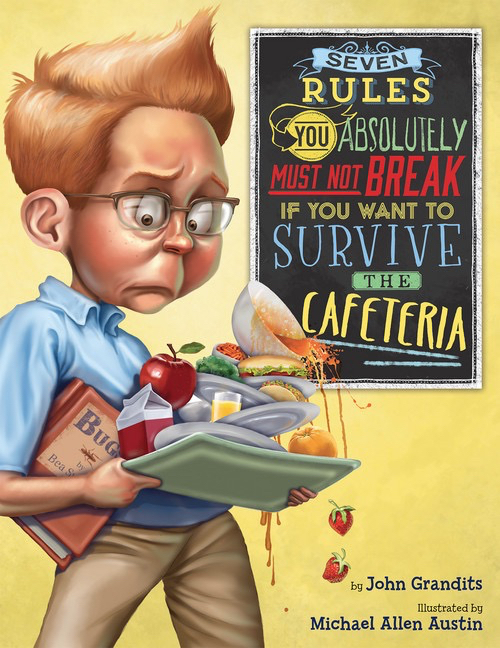 And finally, for the slightly older kids Seven Rules You Absolutely Must Not Break If You Want To Survive The Cafeteria by John Grandits. This is the book for anybody who has ever been the odd man out. The one who sat alone with a book on the bus, rather than sitting with a gaggle of peers. A book for people who sometimes have trouble navigating the events in life that so many other people do with ease. This entirely humourous look at the middle school lunch line is aimed at lower grade school kids. The illustrations, however, made it a pleasure to read, even at my ripe old age. My buddies over at Raincoast Publishing, distributors of all of these fine books, are offering up one of these books (your choice!) for a giveaway to one of my Canadian readers. Enter using the Rafflecopter form below. Odds of winning will depend on the number of eligible entries received. Approximate retail value is $23-$24, depending on prize selected. Open to residents of Canada only. Not responsible for lost or misdirected entries. Contest closes September 5, 2017 at 11:59 pm ET. Good luck! 20 Responses to "Easing Back to School Nerves Giveaway"
We always have back to school nerves, first with my children and now my grandchildren. Its a difficult time. The first feeling about back to school is excited for my grandkids they are ready for the first day ! Both my kids are kind of meh about going back to school. They really enjoy summer! My granddaughter is excited about school! We are both sad about school starting because we have been having a great summer. DD is having a lot of tears too, b/c I'm her 'best friend' and she's going to miss me so much. My grandson is very anxious and nevous about going back. I think my son is both a little excited and nervous. My kids are very excited about back to school right now. That being said, one is starting kindergarten and she is an anxious kid, so I know as the day arrives she will have anxiety about it. one is excited the other not so much! My daughter starts kindy this year...she's super excited and I'm the one who's super nervous! My Children have mixed feelings, excited to see their Friends, but hate getting up in the morning. A bit anxious and excited at the same time! My kiddo is pretty excited about the new school year! I do have dear friends with kids feeling anxious! We didn't have the best weather this summer so it would be nice for the summer to be extended a few weeks. My kids aren't very excited to go back. My niece is very excited for back to school. She can't wait to see all her friends. Emily is excited to go back to see all her friends and getting back into a routine and all the after school activities.